C.P.R. 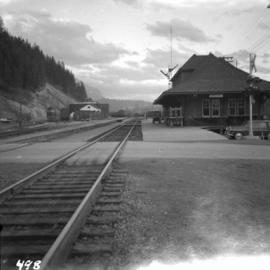 station at Golden, B.C. Photograph depicts the C.P.R. station at Golden, B.C. The view is looking east. Postcard depicts Lower Kicking Horse Canyon near Golden on the Canadian Pacific Railway in the Canadian Rockies. Postcard depicts the first crossing from Golden B.C., over the Kicking Horse River. Postcard depicts Kicking Horse Canyon. Lower Kicking Horse Canyon near Golden, B.C. Postcard depicts the Golden-Field Highway as seen from high up on the mountain side from a tunnel on the CPR run in the Kicking Horse Canyon. Postcard depicts the western entrance to Kicking Horse Canyon.